Louisiana State University Press, 9780807136171, 250pp. Oklahoma is a forgotten territory of "Indians, outlaws, and immigrants" when its first Jewish settler, Boggy Haurowitz, arrives in 1859. Full of expectations, he finds the untamed region a formidable foe, its landscape rugged, its resources strained. 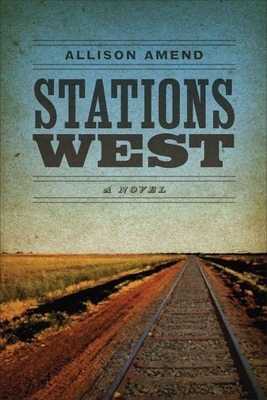 In Stations West, four generations of Haurowitzes, intertwined with a family of Swedish immigrants, struggle against the Territory's "insatiable appetite." The challenges of creating a home amid betrayals, nature's vagaries, and burgeoning statehood prove too great. Each generation in turn succumbs to the overwhelming lure of the transcontinental railroad, and each returns home to find the landscape of their youth, like themselves, changed beyond recognition, their family utterly transformed. Dramatic and lyrical, Allison Amend's first novel, steeped in the history and lore of the Oklahoma Territory, tells an unforgettable multigenerational -- and very American -- story of Jewish pioneers, their adopted family, and the challenges they face. Amid the founding of the West, Stations West's generations struggle to forge and maintain their identities as Jews, as immigrants, and as Americans. Allison Amend, a Chicago native, is the author of the award-winning short story collection Things That Pass for Love. Her writing has appeared in One Story, Black Warrior Review, StoryQuarterly, Bellevue Literary Review, Prairie Schooner, and Other Voices.